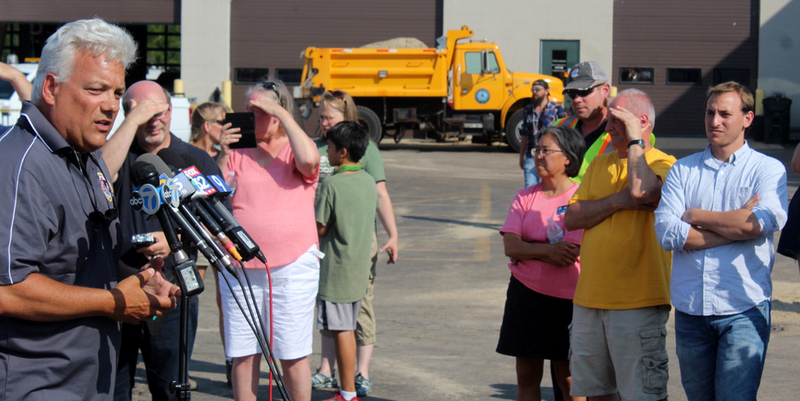 Governor Bruce Rauner speaks to members of the media behind the Algonquin Public Works complex. 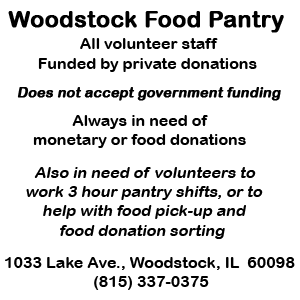 Starting behind the Algonquin Public Works Building, Governor Bruce Rauner thanked volunteers filling sandbags, announced that Cook County was being added to the list of counties declared disaster areas and, then, moved to the street next to the Fox River. Locally elected public officials provide the backdrop for Governor Bruce Rauner’s press conference. In his widely-covered press conference, the Governor said he “may be calling for evacuations,” but would be relying on local officials’ opinions. A view of the reporters and the public officials at the Algonquin press conference on the Fox River’s flooding. 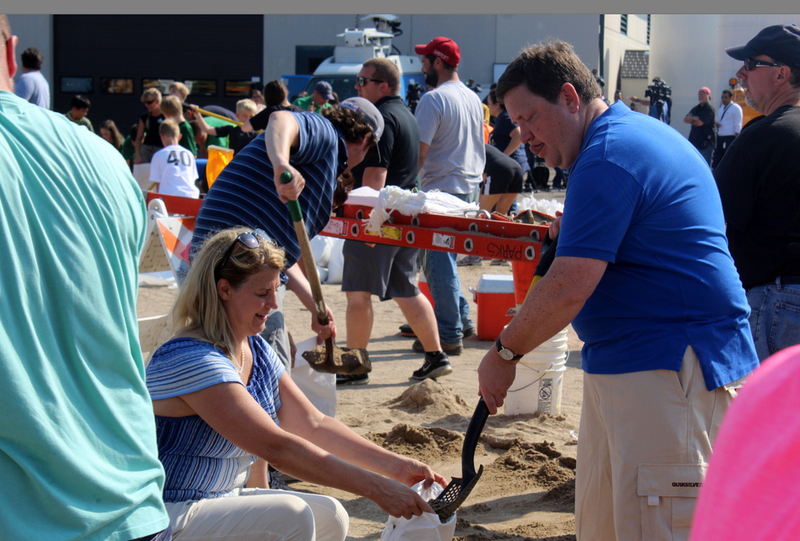 McHenry County Board Chairman Jack Franks thanked the volunteers who were filling sandbags behind the dignitaries lined up behind the microphones. McHenry County Board Chairman Jack Franks addresses the reporters and those wielding cameras. Algonquin Village President John Schmitt addresses the press. 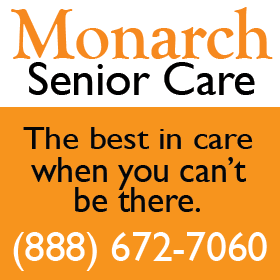 He said that over 25,000 sandbags had been filled. 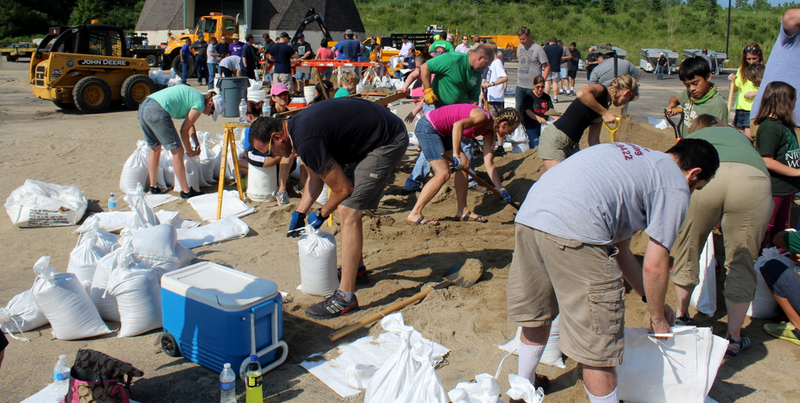 Volunteers who filled sandbags in Algonquin Sunday afternoon. 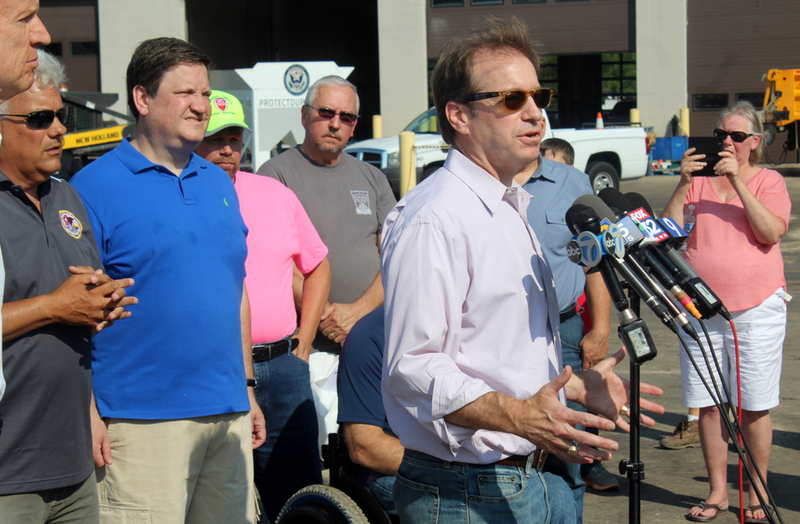 Congressman Peter Roskam expressed “incredible sense of gratitude for those folks who have come out to help their neighbors. State Rep. David McSweeney filled a sandbag held by his wife Margaret. State Senator Dan McConchie gets his turn at the microphone. Rep. Alan Skillicorn, whose district contains Fox River waterfront property in Kane County was the final elected officials to step to the microphones. State Rep. Allen Skillicorn thanked the volunteers and first responders. 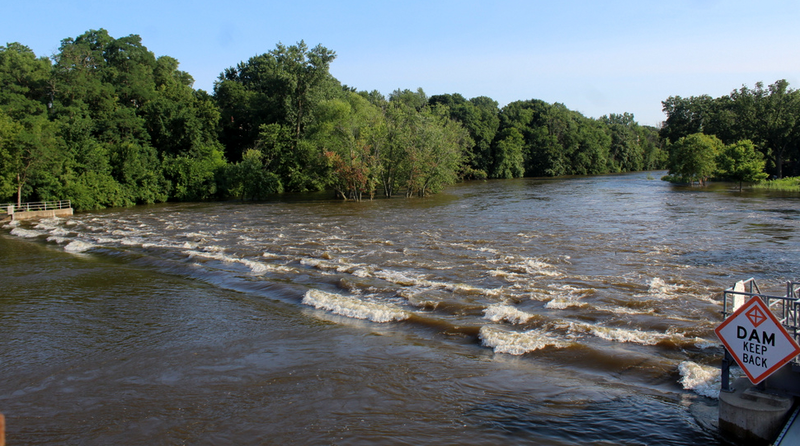 McHenry County Emergency Agency David Christensen told the reporters that the flood is expected to crest Tuesday. In answer to a question about which part of the Fox would flood first, Christensen pointed to Holiday Hills. The Fox River is already around this garage on LaFox River Drive. 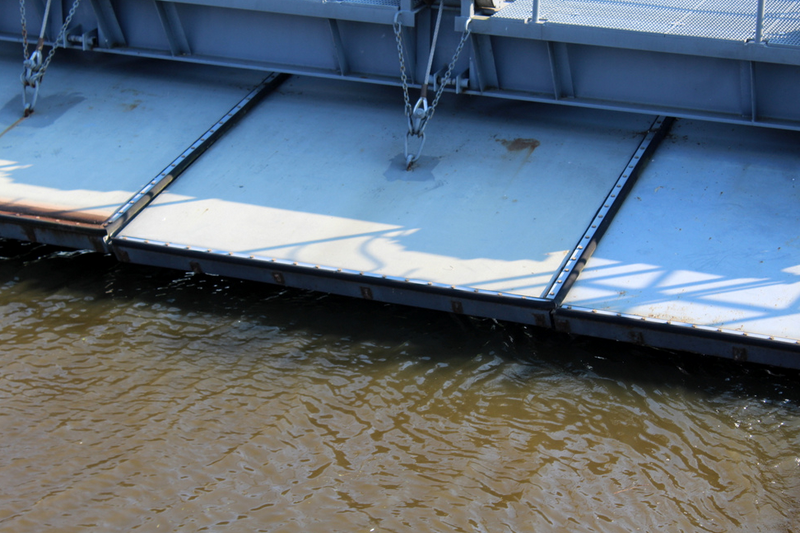 The river is predicted to crest on Tuesday. He said that 818 homes were affected in 2013. The water does not have far to drop over the Algonquin dam this July 17, 2017. 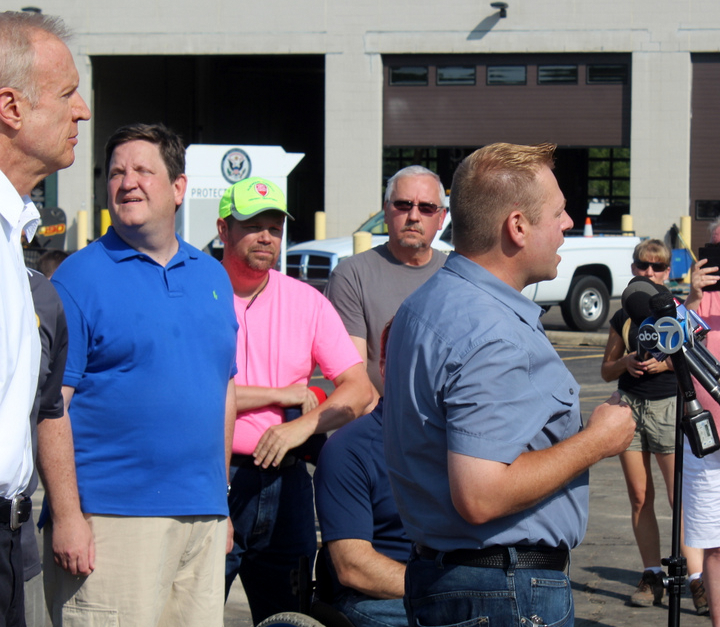 ALGONQUIN – Governor Bruce Rauner today added Cook County to the state disaster proclamation for widespread flooding. 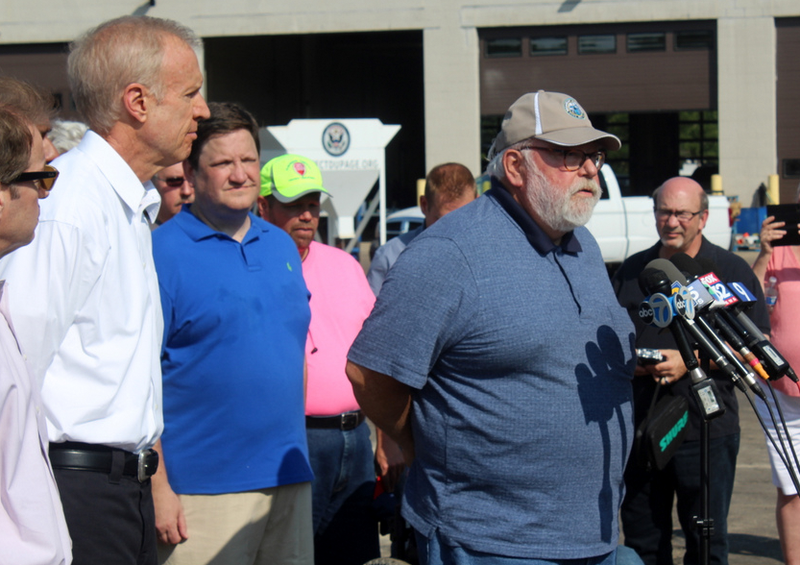 Governor Rauner announced this action while touring flood fighting efforts and impacted residential areas in Algonquin with community, state and federal elected officials. 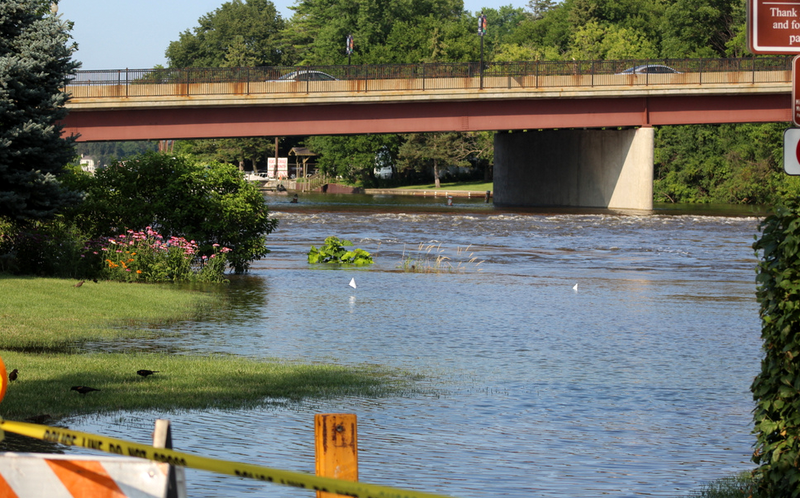 On Friday, Governor Rauner issued a disaster proclamation for Kane, Lake and McHenry counties. Water flowing over the Algonquin dam on July 16, 2017, looks like rapids. “With flood waters impacting communities in Cook County, I’m adding the county to the state disaster proclamation to ensure we provide responders the resources they need to continue protecting public health and safety,” Governor Rauner said. Governor Bruce Rauner leads members of the media down LaFox River Drive. A state disaster proclamation makes a wide variety of state resources available that can help communities respond and recover from flooding. 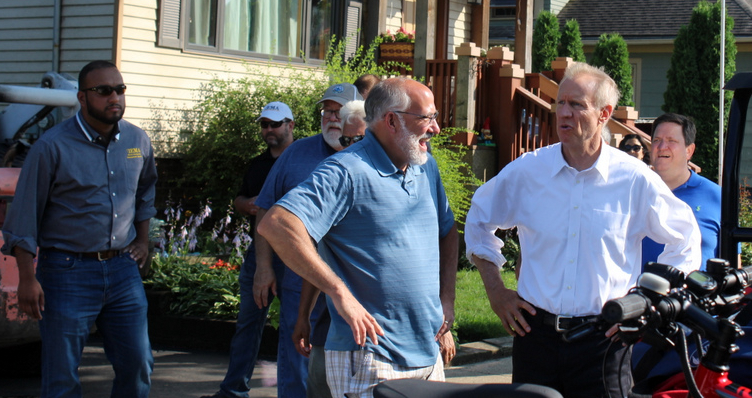 Governor Bruce Rauner came to LaFox River Drive and talked to residents. 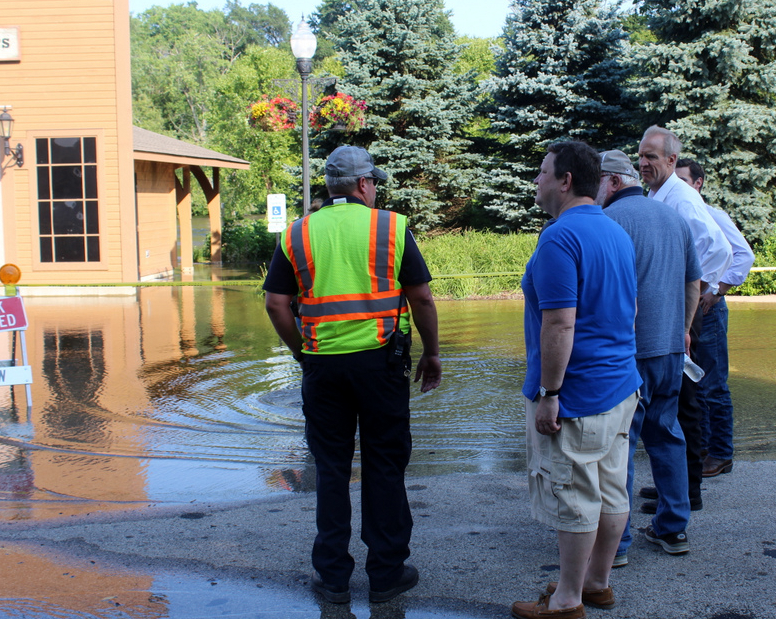 Such resources include sandbags, sand, pumps, trucks and other heavy equipment, and other assistance to ensure public safety. The building with bathrooms at the riverfront Cornish Park was already surrounded by water on Sunday, July 16, 2017. The State Emergency Operations Center (SEOC) in Springfield was activated Friday to coordinate requests for state resources to support communities battling flood waters. The SEOC will remain open until the threat has passed. 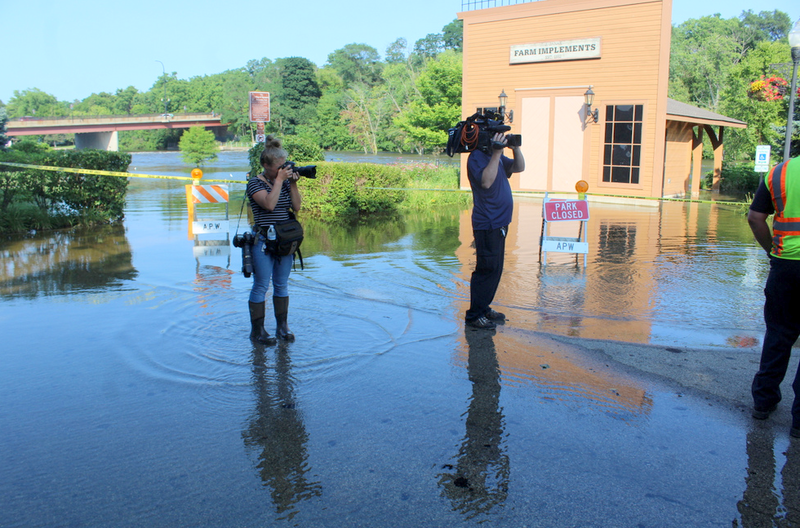 A photographer in knee boots got a shot of Governor Bruce Rauner and entourage looking at the flooding. 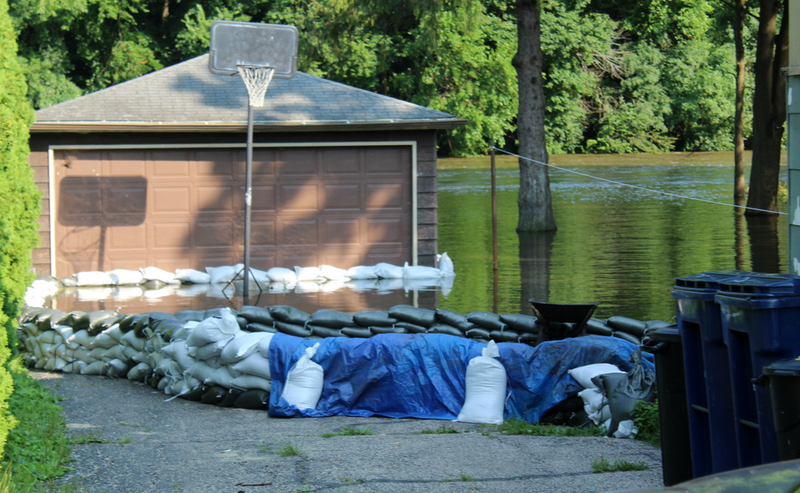 To date, the state has provided 350,000 sandbags to Lake County and 100,000 sandbags to McHenry County. 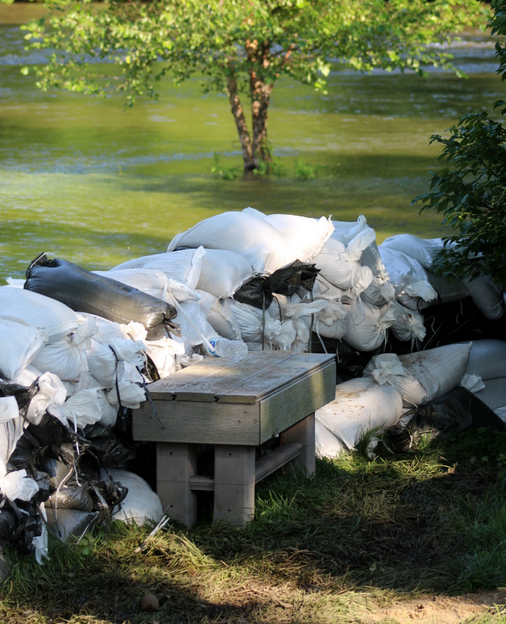 Water from the Fox River had already saturated the earth behind these sandbags at the waterfront home on LaFox River Drive nearest the Algonquin Dam. 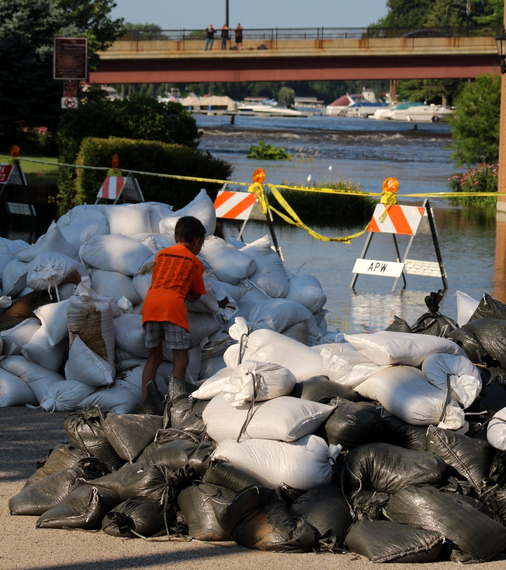 On Monday, 50,000 sandbags will be delivered to Kane County. 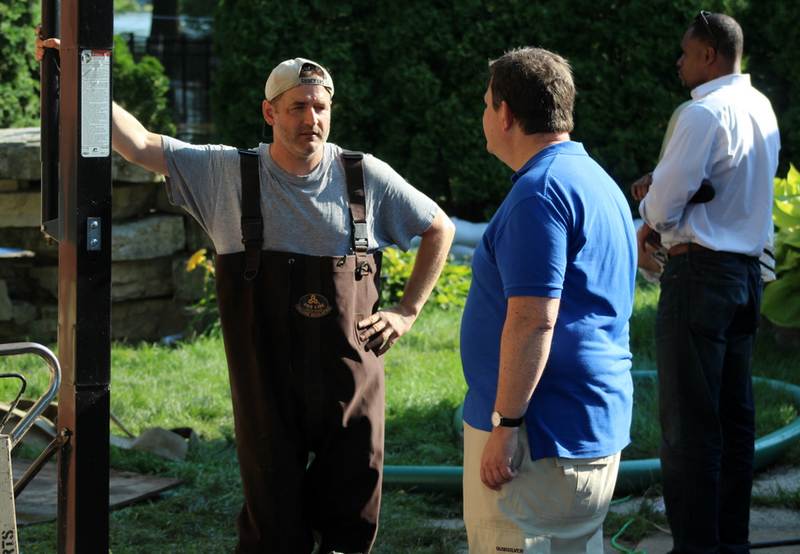 One of the guardians for the home closest to the Algonquin Dam was wearing chest high boots while talking to his State Representative David McSweeney. 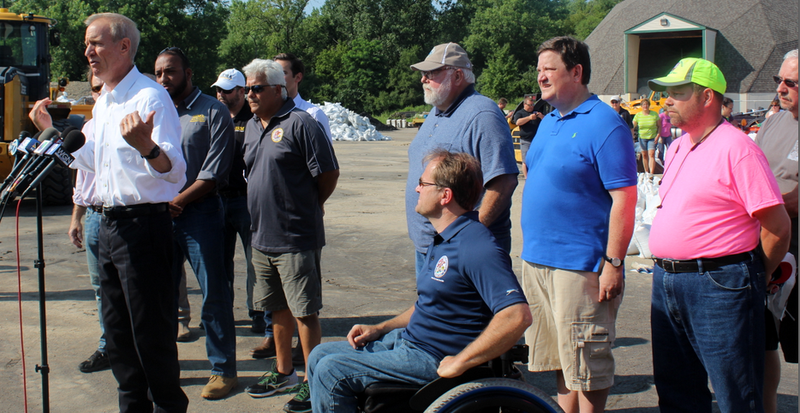 In addition, the state is staging 350,000 sandbags in northern Illinois for quick deployment to communities. The only person stacking sandbags on LaFox River Driver was this young boy. Agencies staffing the SEOC include the Illinois Emergency Management Agency, Illinois Department of Transportation, Illinois Department of Natural Resources, Illinois Department of Public Health, Office of the State Fire Marshal, Illinois Environmental Protection Agency, Illinois State Police, the American Red Cross and the Federal Emergency Management Agency. 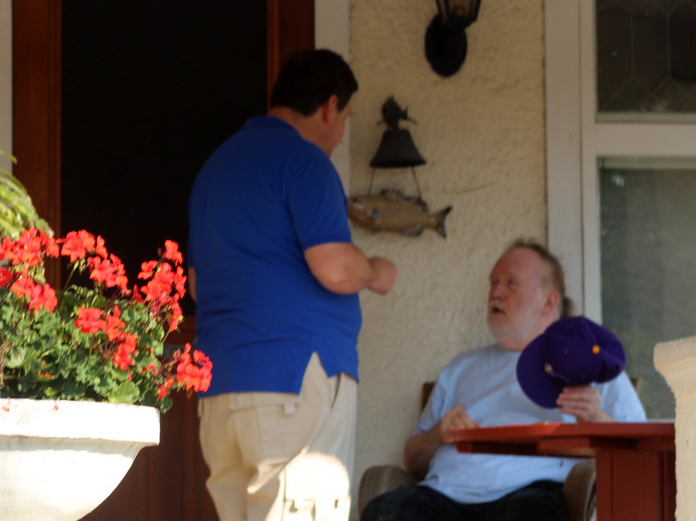 Before he left LaFox River Drive, State Rep. David McSweeney took time to talk to some of his riverfront constituents. 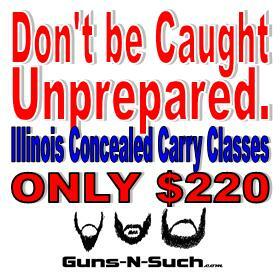 For updates on the current situation, visit the Ready Illinois website at http://www.ready.illinois.gov. Needed should be helped in every possible way in such tragic conditions. Hoping some of the apparent ‘belly fat’ was worked off filling and stacking sand bags. Rauner and Skillicorn at least appear to be ‘working out’. The “round mound” and the new Road Commissioner would be wise to work on their waist lines. Would love to know how many of these concerned politicians continued to fill bags after the cameras went away. The river hasn’t crested yet, and almost all the affected houses were built before new regulations were adapted. It doesn’t seem so wise for Alg to have built that Farm Implement building in the 100 year flood plane less the 500 year which could be matched. I wonder who permitted that, and how they got around the much stiffer regulations? 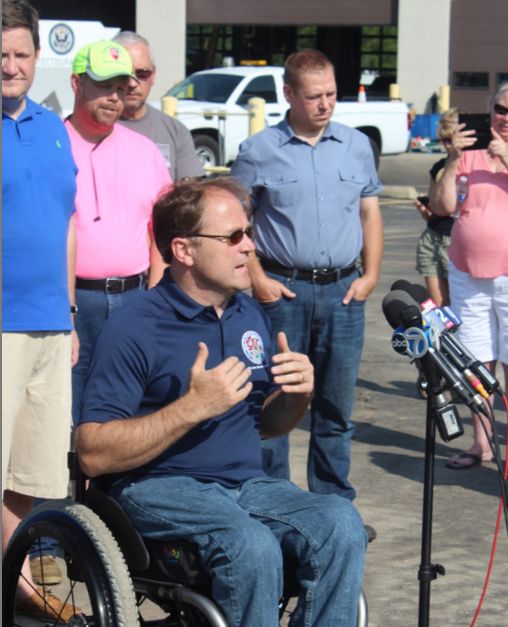 It is sort of funny that the cameras come out and suddenly every state official wants to get out there in their common-guy jeans to take their turn at the microphone to talk about how they are participating in finding a solution to ….. weather events. Maybe it should have been a fundraiser (Windbags for Sandbags?). It’s wrong to body shame anyone, but you do have to wonder why, in this image age, a politician would not consider looking healthy a functional part of the job. Most followed the Governor to the riverfront. Glad to see all the volunteers, shoveling is good for the character and the body. Greater pics still, if only Rauner’s handlers, would have moved the opportunistic Franks out of lens shot. Why is Franks even there? What purpose does it serve for his creepy face to be seen? Gasser should challange Franks to a best two out of three falls, loser leaves town, Sumo match. Prim can be the celebrity guest referee, and we can either stream it live or put it on youtube. They’d have to sign a waver and have Paramedic’s on the seen. 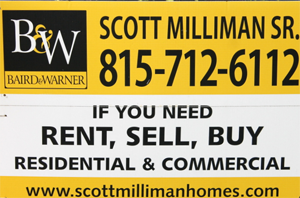 Where’s the $200,000 a year Village Administrator Tim Schloneger at? 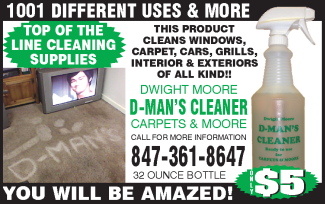 Could he not make it up from his home in DuPage county? At least one of the pols rolled up hisbsleeves and worked. I saw Gasser in the paper this morning handing out sandbags in the grove. Governor Rauner has been sand bagging for the last three years. He should be an expert by now.